Recipe calling for buttermilk? Eating lactose-free and need an alternative? This is it. 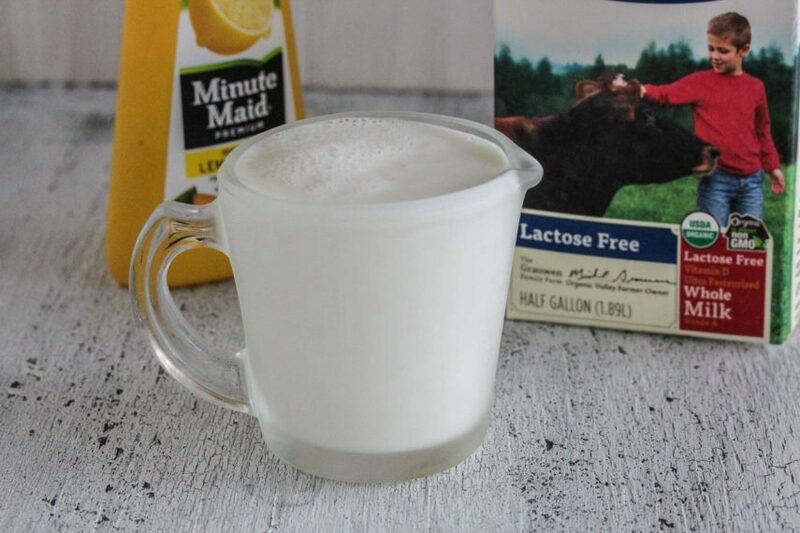 Commercial buttermilk is lower in lactose than regular cow’s milk and you could try it if you do okay with a little bit of lactose, but for lactose-free here is a simple solution. This is not classic buttermilk. You can read more about that in our Explore an Ingredient explaining Lactose-Free “Buttermilk”. 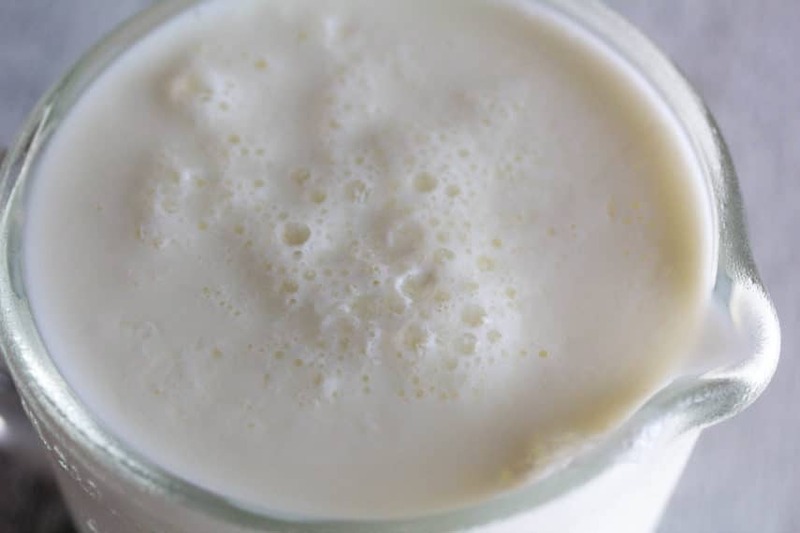 This is a quick and easy soured milk that will work very well in recipes calling for buttermilk. This recipe should be made right before you need it and can be halved, double or tripled with ease. As you will soon see, what you are going to do here is take lactose-free milk (I prefer whole milk) and then add a souring factor. I like to use lemon juice, but you can use vinegar, in which case use apple cider or rice wine vinegar. You could try white vinegar but note that it has not been tested for FODMAPs. If you are leaning towards vinegar because you always have it around and lemon juice is scarce in your house, I recommend checking out Minute Maid 100% Pure Frozen Lemon Juice, available in the U.S. This product is the freshest tasting commercially available lemon juice and has quite a following among food folks. With a bottle of this in the fridge and the freezer you will never be out of lemon juice! Trust me. Minute Maid stopped making it for a while and a bunch of us recipe developers were going a bit crazy and practically had to form a bereavement support group. It is one of those freezer products that the Test Kitchen is never without and you will find many uses for it, too. "Buttermilk" can be low FODMAP if you follow our easy recipe. Measure out milk in a liquid measuring cup and add lemon juice or vinegar and allow to sit for 5 minutes or until mixture has thickened. Use in recipe immediately. If your recipe specifically calls for low fat or fat free buttermilk, you can use the corresponding lactose-free milk in lieu of the whole milk. Would this be safe for fructose malabsorption if using lemon juice? Monash University gives a Green Light to one teaspoon of lemon juice, saying that this amount contains “only trace amounts of FODMAPs.” The category of FODMAP is not specified, so we don’t formally know if fructose is the culprit. Assuming fructose is the FODMAP in question, our Lactose-Free Buttermilk recipe is meant to be an ingredient in another recipe, such as our Monash University Certified Low FODMAP Buttermilk Oat Pancakes, and as such, you would only be consuming Green Light amounts of lemon juice if you ate our suggested portion size. If you are making Lactose-Free Buttermilk for drinking, I would suggest starting with no more than 1/3 cup (75 ml), and increasing the amount by one-third on subsequent days if you have no symptoms. Hi! I recently found out I’m lactose intolerant. I’ve always used Friendship Buttermilk in my baking, which is low-fat (1.5%). 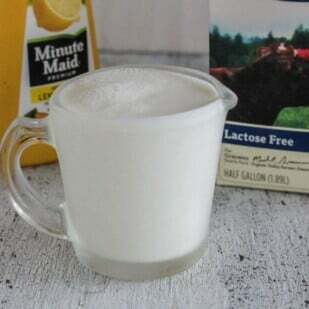 If not I’m trying to substitute a homemade recipe using Lactaid milk and lemon juice, do you think I should go with Lactaid Whole Milk or their 2%? Thanks so much! You can use whatever milk you like – whole or 2% – to create the low FODMAP soured milk for baking. And I meant to add that the recipes I use just call for buttermilk (no indication of whole or low-fat), it’s just that I’ve always used Friendship which i find easily at the store and it happens to be low-fat (1.5%). Thanks!!! In the U.S. commercial buttermilk is usually low fat or no fat. I prefer using whole milk for our recipes and test them as such – but as I said in the other comment, you can DIY any type you like! Always follow a recipe’s specific suggestion – if it is included, such as using a particular type of buttermilk.